Ok, so I'm in some serious wedding planning mode here with my wedding only 4 days away, so today's post is short and sweet (literally, I'm talking about Malaysian style gluten free lemon tofu). Also as a result of wedding planning, I've been eating out a fair amount, providing me the opportunity to give you some reviews on gluten free dining out in Vancouver, British Columbia. So boys and girls, today's topic is gluten free Asian eating. Many of you, like me, have probably had some seriously frustrating experiences eating in Asian restaurants. To be honest, at present, I've pretty much given up hope of ever eating in an "authentic" Chinese restaurant until gf soy sauce makes itself a regular in their kitchens, which is incredibly sad for me given that I live in a province that has one of the largest Chinese expat communities in the world and happens to be the home of the Chinese buffet (see my post on Canadian Food 101 for more on this). I've asked in a couple of Chinese restaurants about finding dishes sans soy sauce, and in one place they told me everything should be fine (?! really?!) and another place got mad at me and told me to just eat salad. Soooo... not so lucky. Unless I find a Chinese fusion restaurant that can offer me some gf dim sum or gf bok choy in black bean sauce, I'm doomed to eating plain rice when out with friends. That said, I've heard that Wild Rice in Vancouver has a decent gf fusion menu, so if any of you have been there I'd like to hear about it, please! However, I've had some really good luck with Malaysian, Thai and Japanese places. So I'm going to give you a super quick run down of some places I've had good experiences with. * Disclaimer here: Although I'm very gluten intolerant, I'm not celiac, and if you have particular questions about how they prepare and sterilize things I can't help with that. All I can say is that I'm crazy gluten sensitive and a drop of soy sauce will send my belly in to spasms (had that happen not long ago at the Thai Cafe in North Burnaby, pretty sure there was soy sauce in their curry broth because I spent the afternoon doubled up in bed afterwards. Even though I told the waitress I was gluten intolerant she brought me soup as an appy. I had to ask her if it was soy sauce free. She said it should be, but after more querying by me I found that it had a chicken broth base with soy sauce in it! Should have known better than to eat the curry after that), so if I haven't been glutinized at these places I assume they're doing a fairly good job of keeping me gluten free. Ok, so here we go: One of my top picks for the BC Lower Mainland is Penang Szechuan restaurant in White Rock (they also have an Abbotsford location but I haven't been there). They've also been rated one of the best hole-in-the-wall restaurants by the Vancouver Sun, which says something - yes, from the outside it looks a bit like a hole in the wall, but that's about it. Inside is super clean, the waiters are always friendly (it's a family biz and so far I've only been served by the men of the house ;) and I'm totally confident when I ask for something to be gluten free, they actually get what I mean by that. My mom and I both eat there or order out quite regularly from them when I'm in town, and as soon as I tell them I'm gluten intolerant, they provide suggestions and substitutions. I mean they actually understand what being gluten free means. And if you happen to be there for lunch, their lunch special is one of the very best lunch deals you can find. Good food, big portions and very well priced. Some of my top picks include their Thai Tofu, Thai Lemon Chicken (it's actually breaded with cornstarch, not flour! ), Malaysian Style Fried Rice, Mixed Seafood with white sauce, and Curried Prawns. Another thing I like about Penang is that I feel comfortable experimenting with different dishes without fear of getting sick because they actually tell me if something is ok, or if they'll substitute a sauce. I like this because I like to try new things when eating out. Also in White Rock is Leela Thai Restaurant. Now I haven't eaten here much lately, but I've been twice in the last couple of years and had some sweet and sour prawns that were very good. As I recall, service was good, staff understood the gluten thing, and the food was ok. Not totally amazingly memorable, but good enough that I would go back again. Next up, Banana Leaf Malaysian Restaurant with a couple of locations in Vancouver. They also do a good job of not poisoning me, and I've been several times. Mind you, I only ever have the Singapore Laksa (a lovely coconut curry soup with seafood and rice noodles and I always end up taking half home for later) because I'm a little less confident in experimenting there and dishes are more expensive. They're much fancier than Penang, and always very busy in the evening which is always a good sign, but it's so loud I find it hard to have a conversation across the table ;p Perhaps if I spent more time investigating the menu and chatting with the waitresses I'd experiment more, I just find that in the evenings the waitresses appear very busy and somewhat wary of my questions (I don't know if they actually are wary, it's just an impression). Another good restaurant is the Thai Garden in New Westminster - I don't believe they have a website, but they are located on the corner of 6th Street and 6th Avenue, across from Royal City Centre. I've had very good luck with lunch and dinner there on several occasions. I've had their Singapore Laksa and their Eggplant Sambal. I also feel comfortable that the staff and cooks understand and accommodate me. Service has always been good, food is consistently tasty, and if you go for their lunch special it is a wonderful deal. None of these places have a specifically gluten free menu, but they do all seem to know to actually get what gluten is! So if you're missing some Asian cuisine and can't get gf Chinese food, try some Malaysian or Thai, but make sure you feel comfy with how the staff responds! 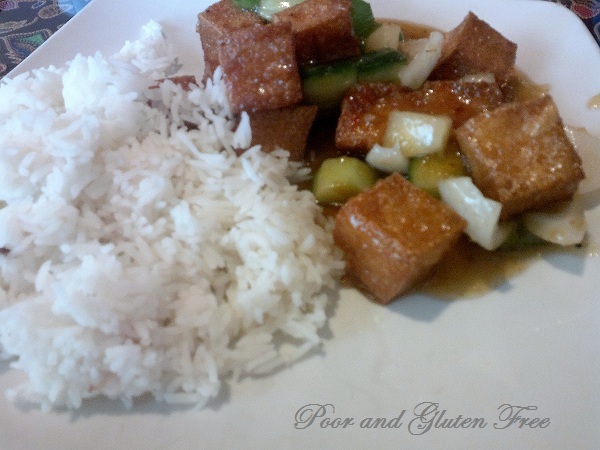 Have you had good luck eating Gluten Free in Asian restaurants? I'd love to hear about your experiences, be they in Vancouver or elsewhere! Do you have a "safe" place or a go-to dish? Banana Leaf is absolutely amazing. I'm celiac but order the pineapple seafood rice and chicken satay (the best of the best). I'll have the try the bowl!